A public service announcement from the American Society for the Cripplingly Self Conscious. Haha! I've got a million of 'em! Okay, well, three or four maybe. 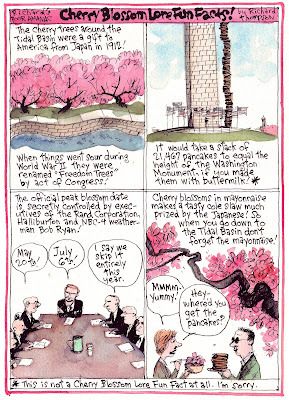 This is Cherry Blossom Time in DC, which means the Cherry Blossom Festival, Parade, Princes and Tourists. At their peak the cherry blossom trees around the Tidal Basin are just overwhelmingly lovely, and as jam-packed as the trail circling the Basin gets it's always worth the hassle to get down there and see them. I doubt I'll make it this year but I hope you all will. For those who don't there's this Almanac from about 7 years ago. At least some of the facts are true (the number of pancakes is pretty accurate if my math's right) but one thing's completely wrong; the blossoms are nowhere near this pink, they're a luminous white with a pinkish cast. But vivid pink's more fun to draw, or paint, and I have kitschy taste. 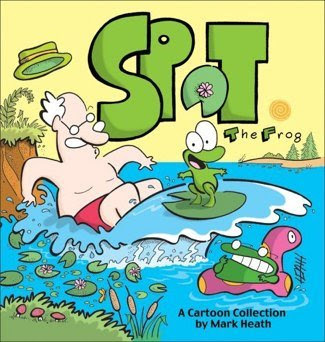 Mark Heath, who draws the poetically comic strip Spot the Frog, is trying to keep the first Spot book in print. He's got a pretty ingenious way to do it, too. Click here to learn what you can do. Hurry! Remember, frogs are the parakeets in the global mineshaft! Tom Richmond's got a Deadline Demon on his blog. So I'm calling mine a Deadline Zombie, and I'm fightin' him right now. And let's celebrate Easter a day early. 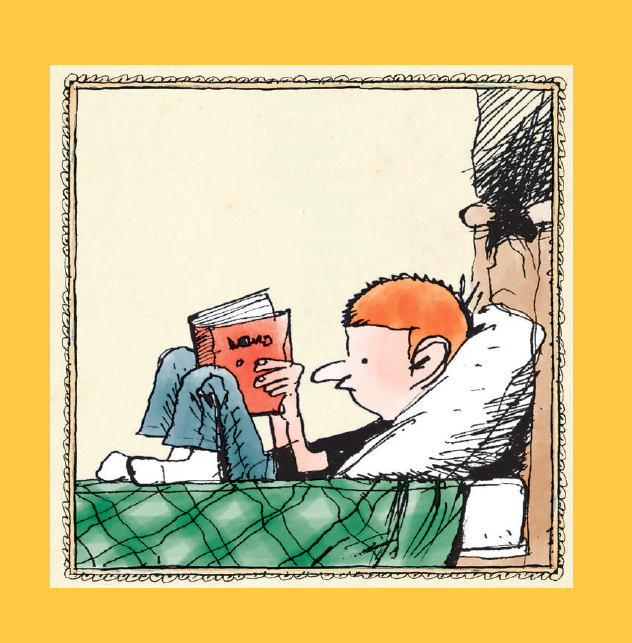 This makes slightly more sense if you know that the Almanac runs in the Post Style section right next to Doonesbury. If I remember right, the editor's only question was if the spelling of "Bunsy" was intentional. I do remember that drawing the rabbit was a lot of fun. 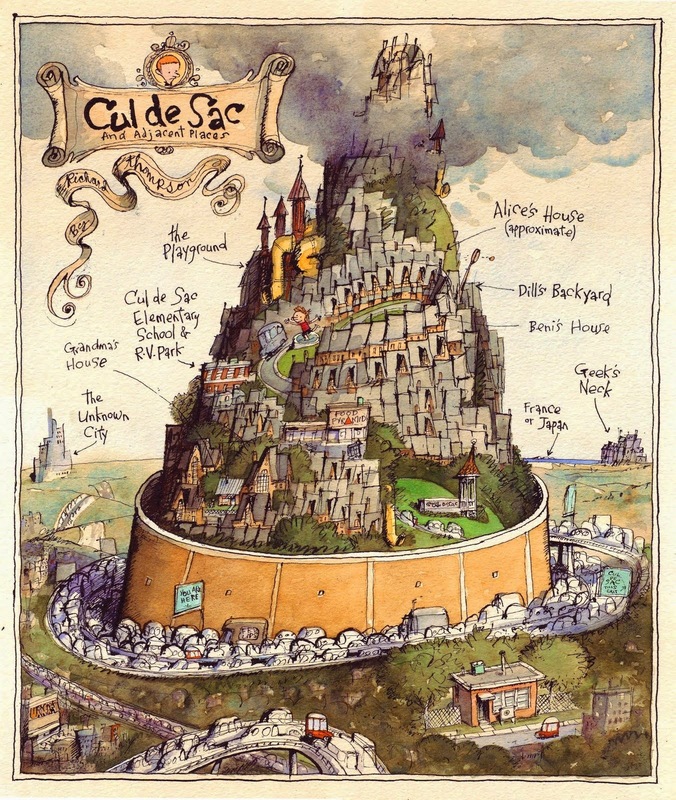 It makes me want to illustrate some Beatrix Potter stories, which'd be a classic case of carrying coals to Newcastle. A few years ago the Smithsonian hosted a traveling exhibition of Beatrix Potter that included a lot of drawings, letters and ephemera. One of the first things you saw when you walked in was a huge blow up of one of the iconic Peter Rabbit illustrations, the one where he's gnawing on a carrot, enlarged to like ten feet tall. On the opposite wall was the original drawing, and it was so small you could've hidden it with your thumb. Something about drawing little twee English animals wearing vests and cravats and such is awfully appealing. Though probably the dream job for an illustrator would be Alice in Wonderland, which has the little twee animals plus an assortment of visually arresting creatures and grotesques. 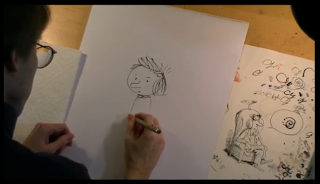 It's hard to improve on the original drawings by John Tenniel, but many have tried and a few have succeeded to some extent, like Ralph Steadman and Peter Newell and Deloss McGraw. But anyway, Happy Easter, and may all your chocolate rabbits be solid. Labels: I thought it was spelled "Almanack"
Let's welcome Spring just a coupla days late. Make the Pie Higher is something from a simpler time, when it was sufficien to make fun of Bush's tongue-tied pronouncments instead of tearing him a new one for his disastrous policies. 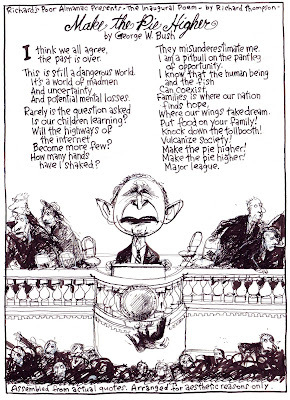 It was drawn the week of Bush's first inaugural, when the lack of an Official Inaugural Poet who'd read an Official Inaugural Poem caused a mild controversy. It's a free verse poem assembled from old Bush malapropisms, and when I did it I was a little nervous that it made no sense and not much of a point. But it leaked out on the web and got a little notoriety, and it got set to music five or six times. If I knew how to market this stuff I'd've made some money, but as it is I'm glad that whoever first posted it on the web put my name to it, though mistakenly elevating me to a Washington Post writer. The drawing hasn't been published since its first appearance 7 years ago and for a while it was lost somewhere in my studio, which swallows drawings at a volume way out of proportion to its size. March is one of my favorite months. It seems to have more character than most months, with all the Lion/Lamb stuff, and during March the weather goes a littlte crazy. Which, as long as it's not too crazy, is just fine by me, especially as the Vernal Equinox hits around the 20th of March. I did this Almanac poem to March about 8 years ago. The day after it appeared snow fell briefly in DC. It's the one instance of actual prescience I can claim. And I liked the poem enough to shorten it up and use it as a jump rope rhyme for Alice. Here's another March poem which I falsely attribute to Carl Sandburg. Drunk on green-dyed Irish beer. I live in Arlington, Virginia, which is both a town and a county. About a mile west from my house is the county line beyond which is the city of Falls Church, Virignia. If you head in the other direction and go four miles east you'll cross the Potomac and then you're in Washington DC. From 1901 to 1903 cartoonist and author James Thurber lived with his family in Washington. He wasn't yet a cartoonist or author, he was mostly a small boy, who'd been born in Columbus Ohio in 1894. His father, Charles Thurber, had moved the family to DC when he was hired as a stenographer to a Justice Department commission headed by an Ohio congressman, and the Thurbers rented a house on I street in Washington. The hot summers and thick humidity DC is known for prompted them to rent a second house out of town for the month of August in 1902. They picked one at 319 Maple Avenue in Falls Church, VA, away from the city heat. The house had a large yard with apple trees and pear trees, and a hedge around it, a good yard to play in for James and his brothers William and Robert. One Sunday afternoon, William was fooling around with a toy bow and arrow set, and he told James to stand over by the fence and he'd shoot him in the back with one of the rubber arrows. William took his time lining up his shot and James got impatient and turned around just as William let fly. The arrow struck James square in the left eye. His mother took him to a GP who dressed the eye, which hurt some but wasn't bothering him too much. But several days later it seemed to worsen and she took him to an opthamologist who recommended the eye be removed immediately. 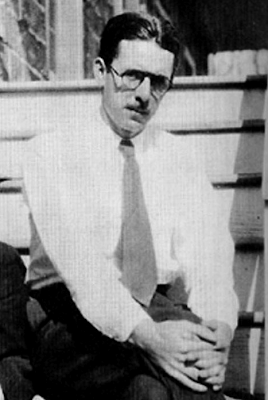 The accident eventually caused Thurber's blindness later in life and he blamed the lack of more immediate drastic care for the effect it had on his right eye. And the accident profoundly affected his work, as he drew larger and larger and used ever thicker lenses to make sense of the visual world. If you leave my house, drive about a mile and a quarter down Lee Highway and turn right on West Columbia Street, then left on North Maple Avenue, you'll come to a dead end street called James Thurber Court.The name of the court is thanks to Mrs. Elizabeth Acosta, a Thurber fan from Falls Church who struck up a correspondence with him in the late fifties, during the course of which she discovered that she was living in the house next to where he lived as a boy in August of 1902. 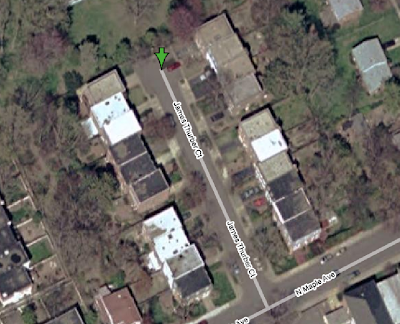 When 319 Maple Ave. was pulled down in the early 60s to make way for townhouses, Mrs. Acosta pushed for the newly created cul-de-sac to be called after its most famous previous resident. I'm going to walk over there some day this spring and take a photo of the street sign, but I'll keep my head down. Sounds like a dangerous neighborhood. My thanks to Bob Burnett for telling me about this. Labels: my neighborhood and welcome to it. This was drawn last week for the New Yorker. 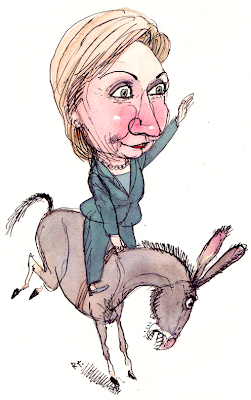 Smack dab in the middle of doing sketches of Hillary falling off pedestals, falling off a donkey, falling off everything, she won some more state primaries and the whole story changed. I was also doing sketches for a similar story for the Atlantic. So everybody scrambled and this drawing was the result, at least of my scrambling. Whatever you may think of Hillary Clinton, we can all agree that she does have a pretty rubbery face, for which I'm grateful. 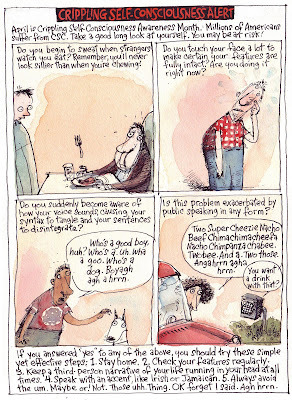 And I gotta say, every time I pick up a copy of the New Yorker I'm awed by the caricatures Tom Bachtell draws for them, sometimes five or six in each issue. Every face is spot on and he never repeats himself. Makes me cry. For some reason our internet connection has slowed down in the last few days. Images and stuff take forever to load; it's almost like back in the days of dial-up. At first I thought maybe it was me, maybe I'd suddenly developed super-powers and was moving real fast and everything just seemed slow to my super-reflexes because, you know, it's all about relativity, And that'd be a boon if I wanted to get ahead on my deadlines, which were especially brutal this week, and if I was the Flash I could draw enough strips to last through next Christmas. But it looks like it's just the internet being slow. I don't think I'd pick super-speed as my super-power. I've always thought the ability to stay awake indefinitely would be the most useful power, or the ability to make someone's foot fall asleep by staring at it, which'd be a hoot at social gatherings. Whatever, the point I set out to make is that I'm not going to post anything real graphicky, with bells & whistles & funny drawings, until the connection gets a little more up to speed. So until then, please feel free to leave a message with a good joke. We all know these are antsy times in the world of newspapers, right? Here are some improvements oughta help a whole lot. 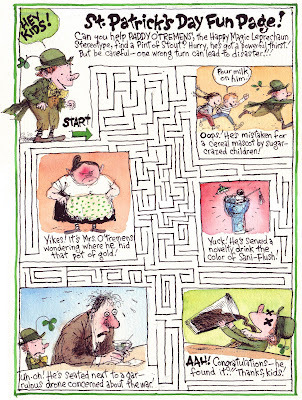 On the subject of Lynn Johnson's For Better or For Worse, I'm guessing eventually the Patterson family will come unstuck in time, like Billy Pilgrim in Slaughterhouse 5, and start bouncing between now and then and next week on a daily basis. Or maybe, like the citizens of Grover's Corners in Our Town, they'll be simultaneously in the here and the hereafter. Or they'll just move to Santa Royale and get bossed around by Mary Worth. 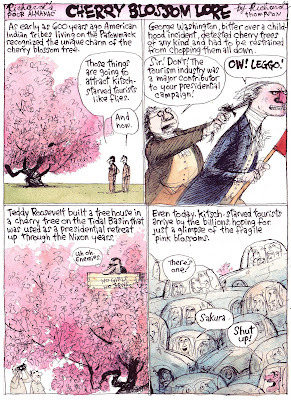 I've heard that Searle plans his work pretty carefully and his unmistakably wiry, sprung lines are laid down with a lot more control than might be apparent. His work always makes me aware of how liquid ink is, how it skips and splotches and pools when it hits the paper. 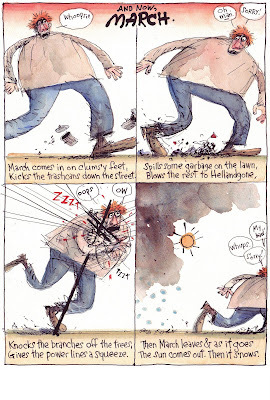 For a long time his style exerted a tidal pull on me, as it has at some point for a lot of cartoonists for over sixty years. Though he used to draw not with ink, but with a kind of stain meant for I think furniture. He liked it because it aged interestingly into a greyish purple, and because it handled differently than regular ink. They don't make that brand of stain anymore, and he's drawn with regular ink for years, and better than just about anyone else. Here's an Almanac that bravely almost mentions an important issue but deftly avoids it for a cheap laugh, like usual. My favorite is the Shaker. You so rarely come across a good Shaker joke these days, but you so rarely come across a Shaker either. I did see a Shaker once, she came to our school in 8th grade to present a program on her religion. I don't think she gained any converts, but it was interesting and, as we'd coincidentally been doing a week of drug-awareness programs, a little confusing in context. I went to a Quaker school up till 10th grade, and I can claim some pretty thick Quaker heritage, but there weren't many Quakers attending the school. Our third grade teacher, Mrs. Harker, was Quaker and sometimes used thee and thou and did it unaffectedly. She was cool and funny and told great stories (the best one was about how she somehow managed to get her car stuck up in a tree). Nowadays if someone asks my religious affiliation I usually say "lapsed Quaker", then I hope they ask how do you become a lapsed Quaker so I can tell them you sucker-punch a Buddhist. It's a lousy joke and no one's ever laughed at it, but someday they might.